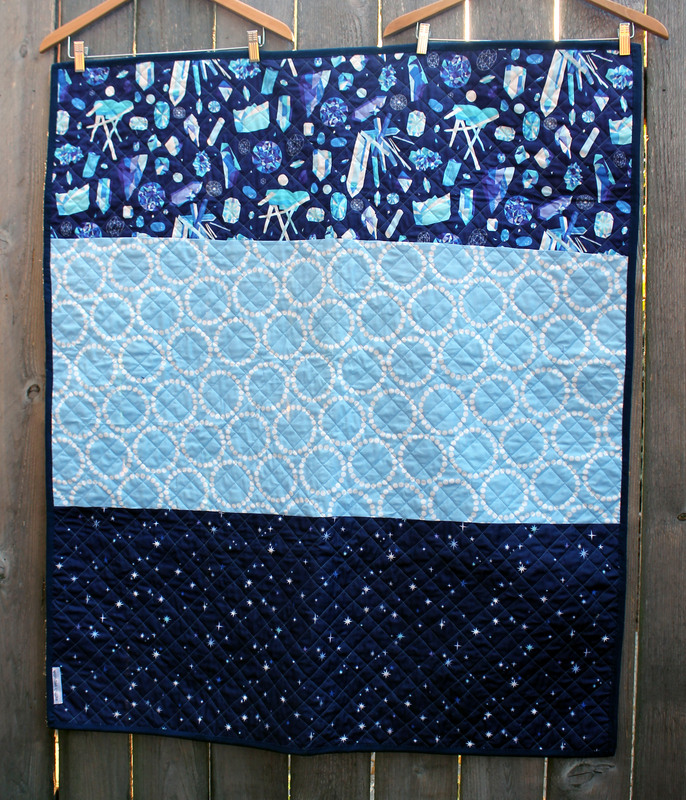 Last week I managed to finish up my Constellation quilt, which is currently winging its way to its new home in Indiana. 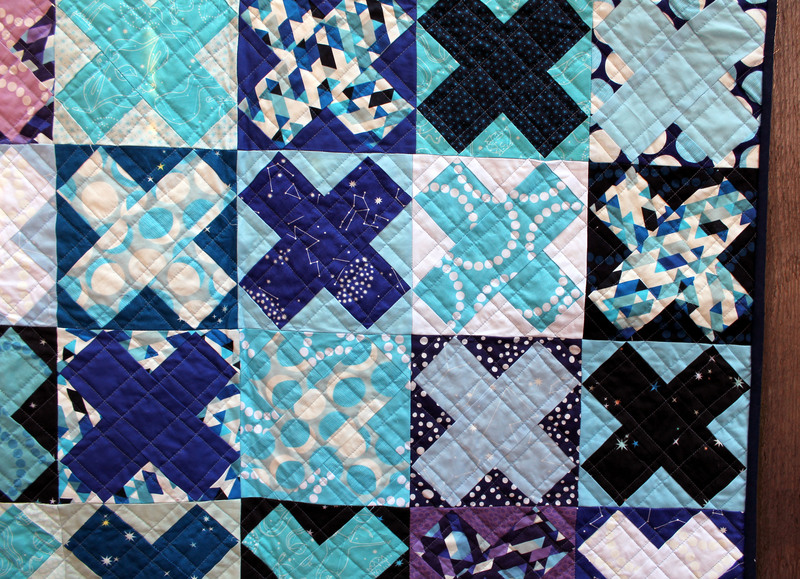 I started this quilt a while ago, after I got my hands on some treasured pieces of Lizzy House’s Constellation line. I have been a big fan of Ms. Houses for a while now…she designs the most fun novelty fabric. I love her bright colour choices and graphic illustrations… and I do not just use them in my charity quilts for kids, I try to sneak Pearl Bracelets into nearly every quilt I make! 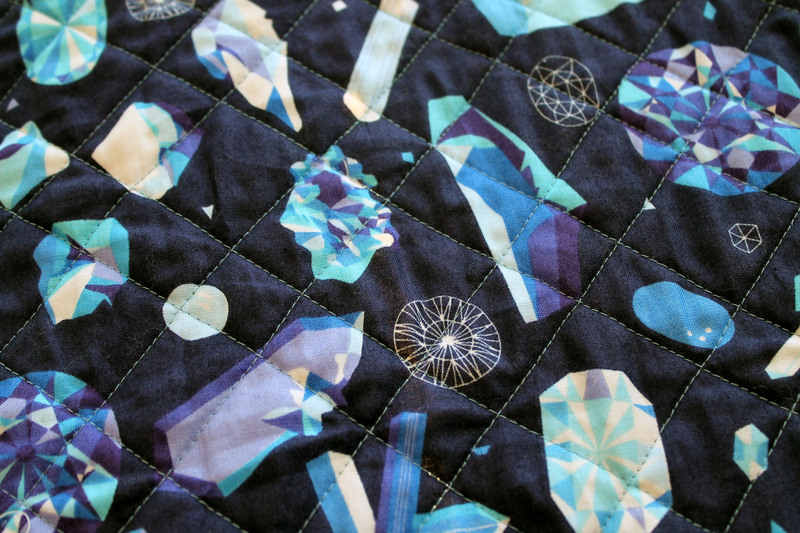 I loved the blues and touch of purple of this line and it was so easy to put this quilt together using just the Constellation fabric line, some Pearl Braceletss and a few supporting solids. I paper pieced the six-inch cross blocks… you can find the free pattern here. To quilt this baby up I just used my walking foot and followed the lines of the crosses. 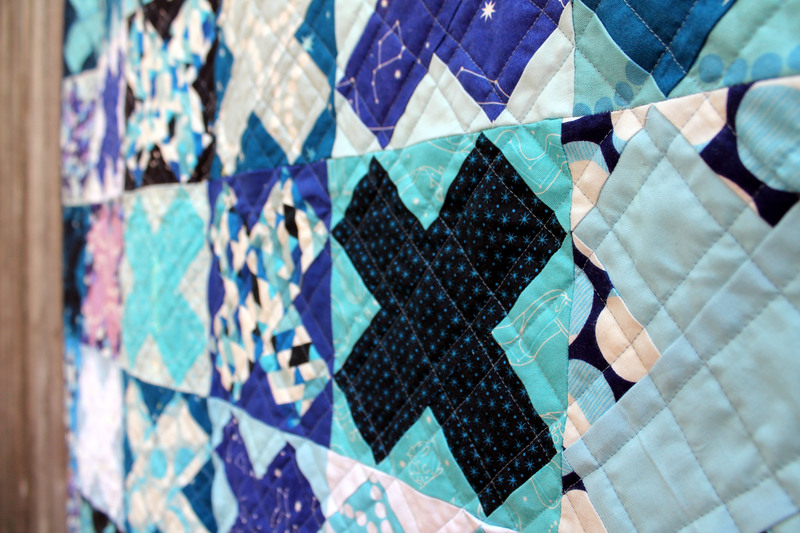 I love how the quilting echoes the crosses, while adding a nice grid pattern to the quilt. 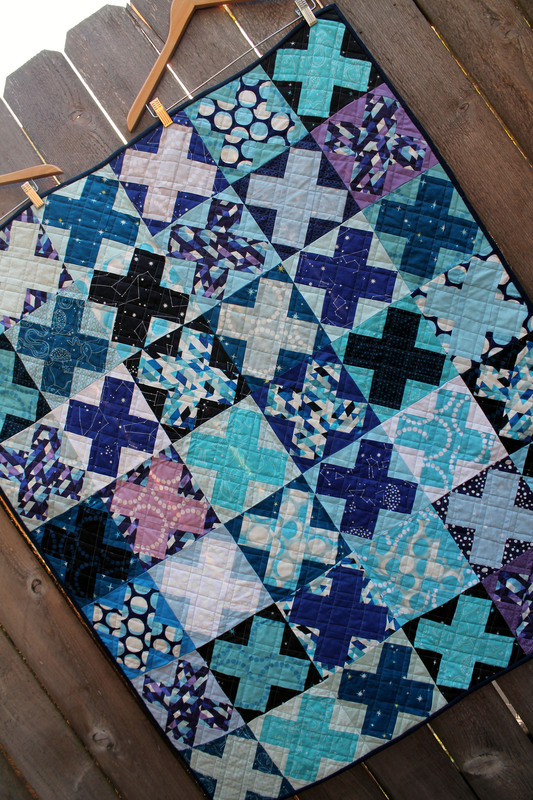 I wanted some denser quilting on this quilt, as it is for my new nephew, Tobias…and I knew from the experience of his big brother’s quilt, that this quilt needed to be able to stand up to pretty constant washing and hardy wear and tear. For the back of the quilt I used three different Lizzy House prints…two of which are from her recent Natural History range. These fabrics just worked perfectly with the front… and I could not resist sneaking this marvelous gem print into the quilt. Now I must warn you this is only one of several Lizzy House quilts I have been working on. I am slightly addicted to Lizzy’s fabrics and am eagerly awaiting her new line, A lovely Hunt, in September… it has unicorns in it! What a lucky boy… It’s lovely. And that last print you used on the back is just beautiful – love those glittering gems! I love the simplicity of this, which enhances the gorgeous fabrics. 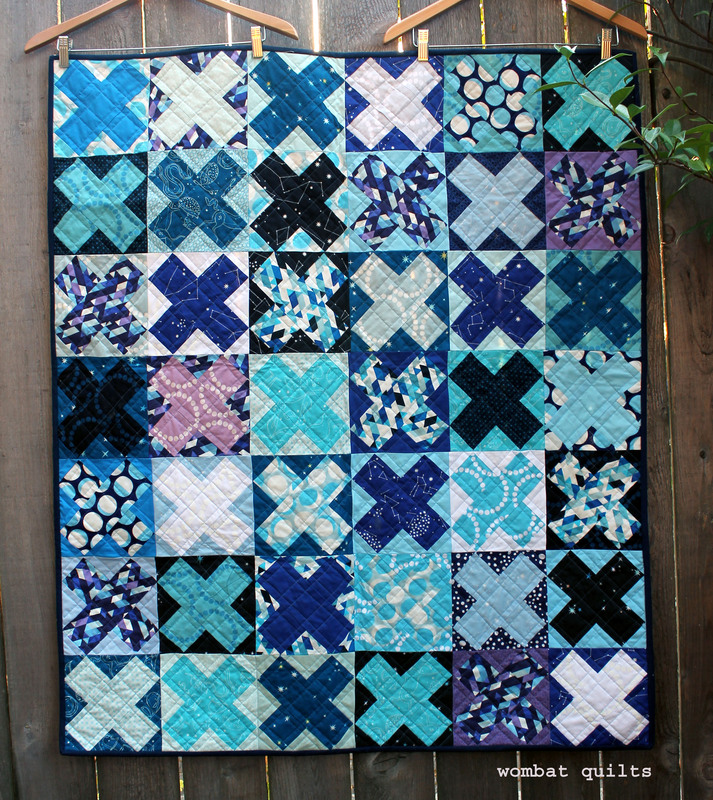 Great “little” quilt, it is a perfect design for a boy. 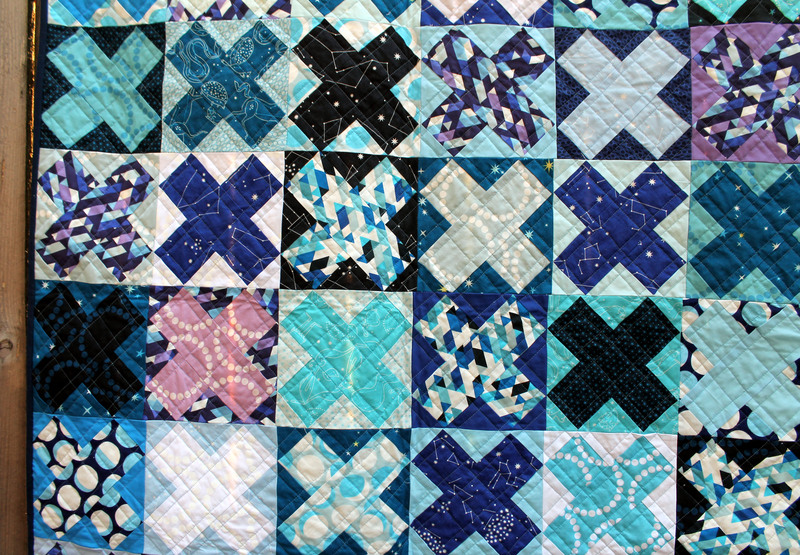 Beautiful quilt ! I love this cross block. It is a simple pattern but very effective. This is really beautiful. Nice job! You must have an endless supply of Pearl Bracelet! I especially like the color distribution on the top–those three lavender ones are perfectly placed.. I love how vivid the colors in her fabric lines are. The quilt is amazing- great job! Oh it’s lovely, like staring up into the night sky, the more you stare the more you see!